I started this business a year and a half ago. Ramona was born about a month after I moved into my own yogurt factory, and shortly after buildout was completed. I finished training my new employees on the day I went into labor. They are the most amazing people and basically had to hit the ground running to run the company while I was home with the baby. I came back to work after a month of being at home but they have basically been running production ever since. I am currently juggling life with a newborn with my new business and it is insane. Maybe one day I will look back and laugh, having “figured it all out.” For now, this concept still escapes me. How to work in physical wellness along with work and family. That is the one piece I have yet to get back into place since starting a business and having a baby. Not freaking out when I have to leave my baby at home with others and go to work. Do you have a favorite time management tool, hack, or other strategy you use that helps you achieve balance that you would recommend? I put my phone in airplane mode at bedtime and leave it that way until breakfast. Beautiful women come a dime a dozen. If you really want to be noticed and appreciated, be successful in business or another endeavor. In this modern world, I am finding it increasingly difficult to live sustainably. In some other countries, they have scarcity issues. I feel like in my life I have an overabundance issue. Especially with a newborn at home, I find myself doing more online shopping. Every week we have so much to dispose of. Cardboard, plastic packaging, bubble wrap, shopping bags… the waste just creeps in and it seems there is no way to stop the flow. I would love to hire someone who could find a way for us to be a more sustainable household without all this waste. I don’t want to do anything but run my yogurt business. Now that I have the baby I am generally in bed by 10pm every night and I love it. Last week we were trying to fit some shelving units into the walk-in, and it seemed like the last one would not fit. We squeezed it in place, and I told my coworkers, “They’re just atoms.” Any time something seems physically impossible I tell myself this and keep trying. Anita Shepherd is a self-taught vegan chef and baker. Anita operated Electric Blue Baking Co. from 2007-2012. While she was most known for her desserts and baked spelt donuts, the savory food at her Smorgasburg food stand was raved about on numerous food blogs. Her passion for vegan cooking has made her a trusted source in the food world. She is a Hotline MVP on Food52.com, where she tackles vegan cooking-and-baking-related questions, and through her YouTube cooking show DIY Vegan, she shares recipes for basic kitchen staples like almond milk, cashew cheese, and coconut butter. Her advice on vegan baking has appeared in The Wall Street Journal, and her recipes have been featured in Bon Appetit Magazine. As a consultant, Anita has added vegan options to the menus of New York City restaurants and cafes. Anita’s Yogurt was founded in September 2013. It is made with organic coconut milk, organic coconut water and live cultures. Anita created the yogurt to use as an ingredient in dessert recipes. 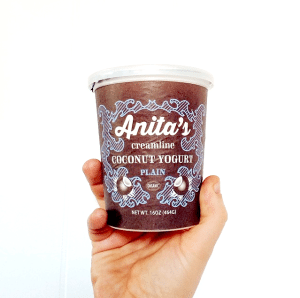 Once the word got out, people got just as excited about pure coconut yogurt as they did for vegan desserts, so she decided to turn Electric Blue Baking into a food manufacturing business and make Anita’s Yogurt her first product.